HomeComputingHow to Reset an IP Address? 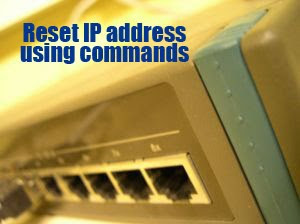 How to Reset an IP Address? For particular reasons, you may want to reset your IP address so that you can continue browsing through the World Wide Web such as when your IP is as same as others in your network or your Internet connectivity is slow. Using the command from your computer without the need to power off, power on or unplug your modem to re-plug again. First, click on the Start button at the bottom on your Windows. Select the Run option and type “cmd” in the box, type “ipconfig/release” (without the quotes). Now your Internet connection is released. After few seconds, enter “ipconfig/renew” (without the quotes). Your IP address is now reset. Open up your Control Pannel, go to Network and Dial Up Connections. Go to your local area connection, select “Properties”. Click on “Internet Protocol (TCP/IP)”. Click “Properties” and select “Use the Following IP Address”. Over there you can enter an IP address available on your network.